The Research Platform for Disease Ecology, Health and Climate is a joint initiative between the Center for Macroecology, Evolution and Climate and the Section for Parasitology and Aquatic Diseases, University of Copenhagen. The platform will bring together experts in ecology, bio-statistics, climate change biology and human and veterinary parasitology in Denmark and abroad, to develop collaborative projects within snail-borne disease ecology, health and climate. The mission is to integrate knowledge across disciplines to enhance our ability to discover new solutions to predict and control snail-borne infectious diseases in a constantly changing environment. The platform is led by Anna-Sofie Stensgaard, assistant professor in disease ecology at the Natural History Museum of Denmark. The team received funding from the Knud Højgaards Foundation for a period of three years to develop the platform. The initial focus twill be on snail and parasites species that are found in Denmark and Europe. However, the long-term aim is to improve the general methodological framework for predicting impacts of climate change not just for snail-borne parasites, but also other climate sensitive diseases. In the initial three year-phase, focus will be on a number of projects that deal with the challenges relating specifically to the observed increase in snail-borne parasites in Europe. Many countries in Europe is currently are experiencing an increase in snail-borne parasites, such as the liver fluke Fasciola hepatica (the sheep liver fluke) and Alaria alata. The restoration of wetlands, grazing of marshy areas by new as well as know potential reservoir mammal hosts, combined with a milder climate, could all feed into this increase. Understanding the role of wildlife is a vital part of understanding the epidemiology and ecology of the changing patterns of these diseases. This project will investigate the role of wild deer in liver fluke transmission in Denmark, and initiate a nationwide mapping of the geographical variation in prevalence between different nature types. Snails are the prerequisite for the transmission of snail-borne parasites, and fine spatial grain data on their historical and current distribution make up an essential baseline to assess changing host-parasite geographies. Yet, very little data on the intermediate host snails have been systematically collated. The Natural History Museum of Denmark hosts the world’s largest historical collection of freshwater snail specimens (the Mandahl-Barth collection), specifically focusing on snails that act as parasitic hosts. However, only a small fraction of this collection is readily available digitally, the vast majority of specimens locked away in drawers unavailable for analysis. an important aim of this project is to digitize this collection and make it available online. Besides the historical collections, a new national survey, covering the major regions of Denmark will be initiated. Methods involve standard sampling methods, but also exploring novel approaches boost data-volume, such as eDNA and citizen science. Temperature is know to exert a strong effect on the disease dynamics of many parasites with complex life cycles, directly affecting crucial steps in their transmission between life cycle stages​. Warming experiments are critical for identifying the mechanisms through which climate change influences parasite population dynamics. 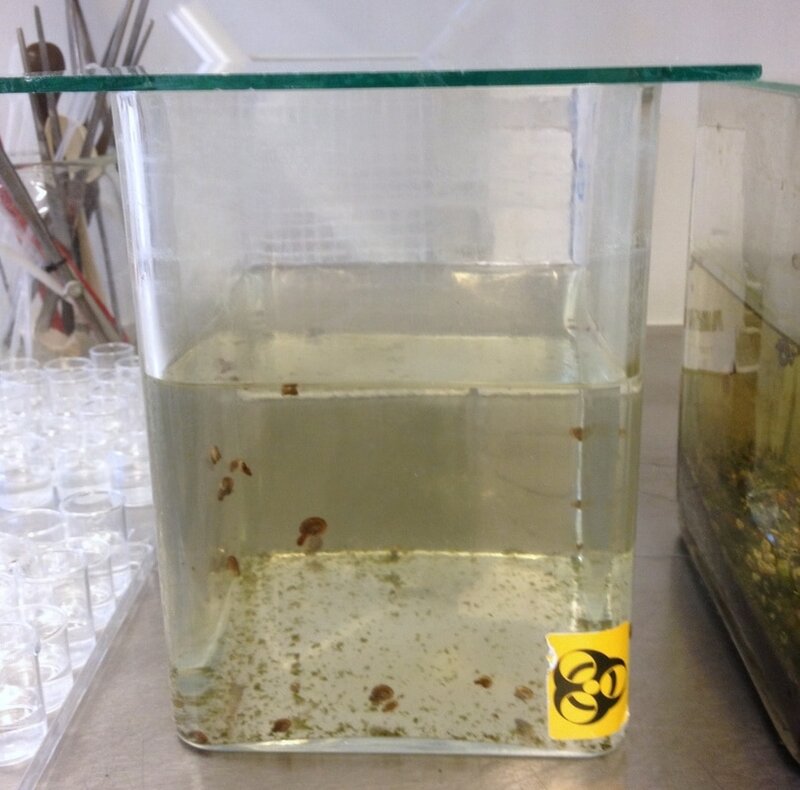 ​To address the lack of mechanistic insight on the effects of warming on the community of snails and parasites, their phenology and interactions; we do lab-based microcosm warming experiments. We are also developing novel outdoor, experimental mesocosms that can support higher levels of biocomplexity. These studies can help fill in the data gaps in mathematical prediction models and elucidate the net effect of global warming on snail-borne disease risk.